I recently acquired what is now the oldest item of postal librariana in my collection. It is a folded letter written on March 14, 1812 by Andrew T. Goodrich to his mother and sister in New Haven, Connecticut. Goodrich was the owner of the A. T. Goodrich and Company Circulating Library and Bookstore in New York City. 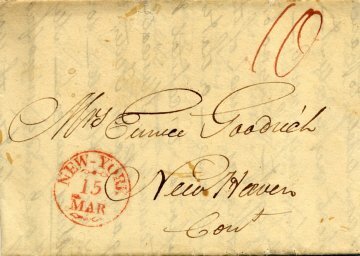 The primary purpose of the letter is to facilitate the move of Goodrich's mother and sister to New York. However, Goodrich also discusses how well his circulating library is doing. Goodrich writes: "My Library is a capital thing. It brings me in money very fast, and the most respectable people in town are among my subscribers, & the number is daily augmenting. There are an uncommon number of respectable & beautiful young Ladies who are my subscribers, and who of course bring with them their attendants … Mr. Goodrich's Circulating Library & Bookstore will soon be known as 'genteel and fashionable'." The library and bookstore also sells "the Ladies their new music & fancy stationary." A catalog of the Goodrich library was published in 1818 and included 1,765 books. In A Book For A Sixpence: The Circulating Library in American (Beta Phi Mu, 1980), David Kaser reported that of the books listed in the catalog, 53% were fiction and 16% were literature. There is a list of libraries in 19th century New York City on Wikipedia which includes the Goodrich library. Although the letter is not in great shape, it is still a very nice item to add to my collection. Do you write poetry? Are you a USF Student? Want to perform your original work in celebration of National Poetry Month? Then keep reading! The Gleeson Library Poetry Committee is gearing up for our 4th annual faculty, staff, and student reading. Lily Iona MacKenzie and Kelci M. Kelci (yours truly) will headline, and we want some student poets to open up the show. The reading will take place on Thursday, April 19, 2012 in the library’s Rare Book Room from 5-6:30 p.m. The deadline to apply is Friday, March 16, 2012. If you apply, please make sure you will be available to read on Thursday, April 19, 2012 from 5-6:30 p.m. Please understand the number of readers on the program will be limited and the selection committee is seeking a diverse representation of USF students to complement the established readers. We anticipate not being able to accept all applicants. Decisions of the selection committee are final. Thank you! We look forward to reading your work. "In late March 1913, an unusually heavy rainstorm moved into Ohio. It rained steadily for five days and the streams all over Ohio rose rapidly. By the third day of the downpour, levees were overtopped and many towns suffered disastrous flooding. Great fires that raged unchecked added to the destruction and the loss of life. When the flood waters receded, tons of mud and debris covered the streets, homes, businesses and factories. The death toll stood at 361. Property damages were well over $100,000,000 and 65,000 were forced to temporarily leave their homes." 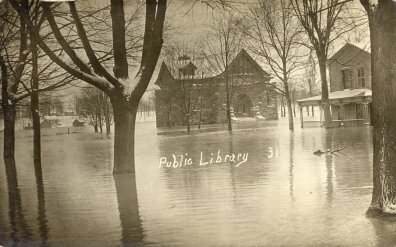 The previous quotation is from a description of a photograph in the Ohio Memory Collection showing the flooded Defiance (OH) Public Library. I recently acquired the Real Photograph Postcard shown above which also shows the Defiance Public Library during the 1913 Ohio flood. Defiance received a $22,000 grant from Andrew Carnegie in 1904 for a new public library building. A beautiful site on the grounds of the former Fort Defiance at the confluence of the Maumee and Anglaize Rivers was chosen for the new building. The building opened on July 4, 1905. The Carnegie building (expanded and renovated) is still occupied by the library. Larger cities impacted by the flood of 1913 included Dayton and Columbus. The Dayton Public Library was also flooded. Water was 16 feet deep in the library and caused the loss of 45,000 books (see picture). More on the flood can be found HERE. Hello! USF Book Club continues its procession of books about kids who have lost their fathers with The Invention of Hugo Cabret by Brian Selznick. We will meet on March 16, 2012 from 12-1 pm in room 314 of Gleeson Library (note the different room — up on the third floor). How to get the book: Request it through Link+ or get it at SF Public. Unfortunately it is not available in e-format. Interested in Book Club? Check out our wiki page or email kbaughmanmcdowell@usfca.edu to sign up for the mailing list. Here is a true masterpiece—an artful blending of narrative, illustration and cinematic technique, for a story as tantalizing as it is touching.Twelve-year-old orphan Hugo lives in the walls of a Paris train station at the turn of the 20th century, where he tends to the clocks and filches what he needs to survive. Hugo’s recently deceased father, a clockmaker, worked in a museum where he discovered an automaton: a human-like figure seated at a desk, pen in hand, as if ready to deliver a message. After his father showed Hugo the robot, the boy became just as obsessed with getting the automaton to function as his father had been, and the man gave his son one of the notebooks he used to record the automaton’s inner workings. The plot grows as intricate as the robot’s gears and mechanisms [...] To Selznick’s credit, the coincidences all feel carefully orchestrated; epiphany after epiphany occurs before the book comes to its sumptuous, glorious end. Selznick hints at the toymaker’s hidden identity [...] through impressive use of meticulous charcoal drawings that grow or shrink against black backdrops, in pages-long sequences. They display the same item in increasingly tight focus or pan across scenes the way a camera might. The plot ultimately has much to do with the history of the movies, and Selznick’s genius lies in his expert use of such a visual style to spotlight the role of this highly visual media. A standout achievement.